German company BREYER, in collaboration with the Institut für Kunststoffverarbeitung (IKV) Aachen and Hille Engineering GmbH & Co KG, has developed a gap impregnation facility with new tooling technology. According to BREYER, it allows the automated production of a vehicle bonnet made of carbon fibre reinforced plastic (CFRP) in only 15 minutes. Sandwich elements can be manufactured in a single step. Using a fibre composite design, the weight of the bonnet can be reduced by 60% to about 5 kg. The tool comprises a tool frame and two mould halves. The maximum clamping surface size is 1.2 m x 1.7 m.BREYER adds that the tools’ surface topography has been optimised to allow direct painting of components, which is an essential step to more efficient and automated production. 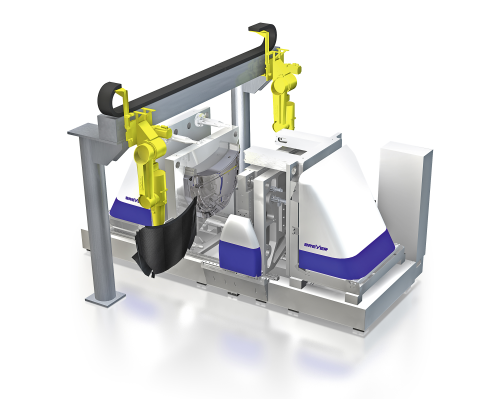 The sandwich construction structure supports connecting elements for mounting in order to avoid subsequent installations of additional elements on the formed part.No elaborate preparation is necessary in order to set-up the machine, as is required for presses for example. Both process and machine are designed for low pressures (<10 bar), hence the whole construction is smaller than for high pressure machines. Fast open-close movements can be carried out with linear units that offer energy savings.For fully automated production, the machine is provided with a handling system. Other machine sizes are being considered, according to requirements of the moulded components.